Abu Hamza al-Masri is probably the most frequently abused and ridiculed figure in this country. So said his own lawyer, Edward Fitzgerald QC, as he opened his client's defence at his Old Bailey trial. Born Mustafa Kamel Mustafa in Alexandria, Egypt, on 15 April 1958, Abu Hamza was the son of a naval officer and a primary school headmistress. He initially studied civil engineering before leaving for England in 1979. In London, one of his first jobs was as a nightclub bouncer. He married a British woman and decided to resume his studies at Brighton Polytechnic. His marriage rapidly broke down, but he later remarried and had seven children. One of Abu Hamza's first major engineering contracts took him to Sandhurst, the Royal Military Academy. Technical drawings of the college were still in his home when he was arrested in 2004. It was during this time that the young Mustafa started to show an interest in Islam and politics. The period coincided with the Iranian Revolution, a key moment in the development of the modern Islamist thinking that led ultimately to Osama Bin Laden and others. Guilty of 3 charges related to "stirring up racial hatred"
Guilty of 1 charge of owning recordings related to "stirring up racial hatred"
Guilty of 1 charge of possessing "terrorist encyclopaedia"
Not guilty of 1 charge related to "stirring up racial hatred"
These thinkers were calling for Islamic states in Islamic lands. They had a military face in the Mujahideen fighters who, backed by the USA, emerged to oppose the Soviet Union's occupation of Afghanistan. And when some of these veterans came to London for specialist medical treatment on Harley Street, Abu Hamza became one of their translators. In 1987, these encounters led him to a critical experience: he met Sheikh Abdullah Azzam, the founder of the Afghan Mujahideen, while undertaking the Hajj, the pilgrimage to Mecca. Shortly afterwards, he packed his belongings into a crate marked for Afghanistan and, according to his evidence at his trial, "went there intending never to return". 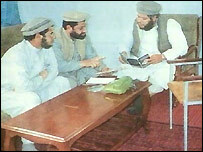 Abu Hamza began working in the Jalalabad region, taking part in reconstruction schemes. It was during a related demining project that he lost his hands and one of his eyes. He returned to the UK in 1993 for treatment. But within two years he had left Britain for a second time to support Bosnian Muslims during the worst of the break-up of the former Yugoslavia. He was not the only British Muslim to go there - and the experience of those who did has played a key role in the radicalisation of Islamic politics in the UK. 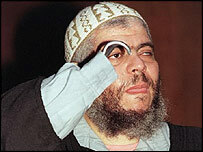 Abu Hamza quickly became a leading figure in the British Islamist scene. He was spending more and more of his time preaching while churning out leaflets calling for jihad against corrupt Middle East regimes. In 1997, he arrived at Finsbury Park Mosque. During his trial, Abu Hamza told the Old Bailey he was invited to the mosque to resolve tensions between South Asian and North African prayer-goers. Another theory suggests he gravitated to the mosque thanks to his political contacts in the Algerian community: Abu Hamza had been writing extensively about the Islamist GIA organisation which had been waging a violent campaign against the Algerian government. While the precise details are unclear, there are suggestions that the police and intelligence services were already watching Abu Hamza along with other militants who had been permitted to settle in the UK. According to Abu Hamza himself, MI5 first contacted him in 1997 shortly after extremists massacred 68 tourists at Luxor, Egypt. These meetings continued for some years, he told the Old Bailey, and included a warning that he was "walking a tightrope". But it was in 1999 that Abu Hamza and Finsbury Park Mosque came to national prominence. Scotland Yard questioned the cleric on suspicion of alleged bomb plots in Yemen. While Abu Hamza was released, his son, Mohammed Mustafa Kamel, was jailed in Yemen for three years for involvement in an alleged campaign of violence. Despite this brush with the law, Abu Hamza was consolidating his hold at the mosque. It had become a hostile environment for anyone who was not a supporter, with his closest confidantes barring access to anyone they did not trust. The original trustees were still the legal owners, but they had virtually no control over the mosque's day-to-day affairs. Many of the original congregation had turned elsewhere. An attempt to resolve the stand-off came to nothing as a settlement between the trustees and Abu Hamza quickly unravelled. Abu Hamza, referred to as "the Sheikh" by his followers, was delivering almost all of the sermons and permitting those sympathetic to his message to sleep in the premises. And on the first anniversary of the 9/11 attacks, he co-organised a conference at the mosque praising the hijackers. The security services were increasingly gathering intelligence on what was happening inside. Terrorism suspects had passed through the building while its office was being used to disseminate information to a network. On 20 January 2003, police raided the building as part of a major investigation into an alleged plot to produce ricin poison. They sealed the mosque and handed it back to the trustees. Abu Hamza himself was not arrested in connection with that probe. But despite being denied a base, he preached outside its gates every Friday. This bizarre stand-off between Abu Hamza and the authorities continued into 2004. Then, Washington named Abu Hamza as a "terrorist facilitator with a global reach" and he was arrested pending extradition. Five months later, he was charged with 15 UK offences associated with his sermons and information contained in the Encyclopaedia of Afghan Jihad.